KUALA LUMPUR: The wife of former Prime Minister Najib Razak arrived at the headquarters of the anti-graft commission on Tuesday to give her statement on investigations into a former unit of state fund 1Malaysia Development Berhad (1MDB). The multi-billion scandal at 1MDB dogged Najib and his family in the last three years of his near-decade-long rule, and was a key reason for his shock defeat in a May 9 election. Najib has already made a series of statements to anti-graft investigators. Attention has shifted to his wife, Rosmah Mansor, after police found hundreds of luxury handbags, jewelry and cash during raids on apartments linked to the family. Rosmah arrived in a convoy of four private cars at the headquarters of the Malaysian Anti-Corruption Commission (MACC). Flanked by security guards and her lawyers, she stepped out of a silver Mercedes carrying a bright red handbag that appeared to be a model made by Italian luxury fashion brand Versace. 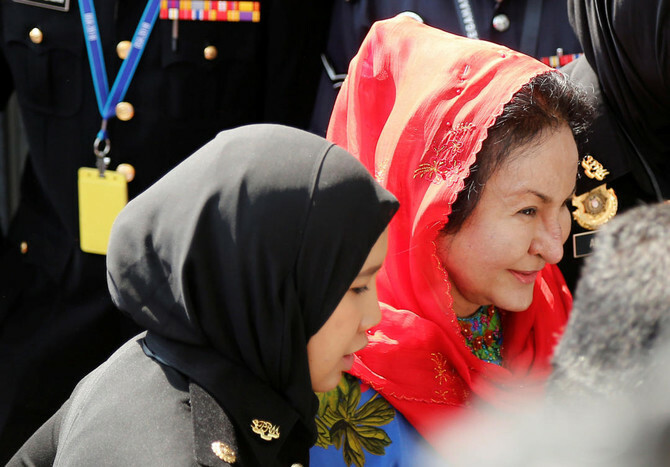 Rosmah walked through a throng of journalists waiting for her arrival and was accompanied by her daughter Nooryana Najwa. Rosmah is expected to give her statement to anti-graft investigators in connection with a suspicious transfer of about $10.6 million into Najib’s personal bank account that has been traced to the former 1MDB unit SRC International. The sum is just a fraction of the billions of dollars allegedly siphoned from 1MDB, the state fund that Najib set up. He has denied any wrongdoing and was cleared of any offense in an earlier Malaysian enquiry. M. Puravalen, a lawyer acting for Najib and Rosmah in connection with the SRC investigations, said on Tuesday he had “ceased acting” for Najib and Rosmah. In raids over the past weeks, police have seized 114 million ringgits ($28.6 million) in cash and more than 400 handbags. Experts were being brought in to value the jewelry, watches and other seized items. My suggestion: yes, corruption should be punished very severely. In order that corruption is ‘not necessary’, however, salaries should be increased. Shalat or prayer 5 x a day—and fasting every year for one month, then go pilgrim to Meccah —still cannot prevent Muslim from corruption—it is a true fact. What is wrong? What is wrong ? Because most Muslim commit Syrick rvery time they pray and every time go pilgrim. Hopefully Ahmadiyyah Muslim do not commit syrick, syrick is the biggest sin in Islam.